A lesson in finding yourself from ‘Finding Fanny’! There will be times in Life when you will find yourself lost. Don’t panic or feel frustrated at such times. Know that only when you are lost, can you find your way – and find yourself! 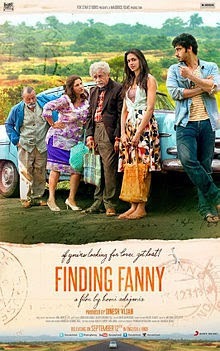 I recently watched this very cute Bollywood English film called Finding Fanny(2014, Homi Adajania, Naseeruddin Shah, Dimple Kapadia, Pankaj Kapur, Deepika Padukone and Arjun Kapoor). The story revolves around how Ferdie, an old postmaster, goes in search of his lady love, Fanny, who he had lost contact with 46 years ago. Ferdie is supported in his search by Angie, a widow who lost her husband on the day of their wedding six years ago. Tagging along with Angie is her mother-in-law, Rosie, who claims her husband is dead but the truth is he ran away with someone else and Rosie makes up his “lost in the sea” story so that she doesn’t lose face in the village. Then there’s the man who has loaned his car for the search journey, an artist, who has a fixation for “big women” – and Rosie is his latest muse. Driving the car is young Savio, whose inability to profess his love for Angie to her in the first place, led to her wedding and subsequent widowhood! As the story unfolds you discover that while finding Fanny is indeed the context, each of these characters is really searching for something they are missing in their own lives. Each of them has lost something – most importantly, precious years of their Life – and are seeking love and belonging in their own ways. That’s where, subconsciously Finding Fanny, connects to our own real, everyday, lives. Each of us, at different times in Life, in different, often unique, contexts, will find ourselves lost. Either a job might have become listless or a relationship may have lost its very meaning. Or, sometimes, just raising a family – bringing up kids, attending to parents and in-laws, providing for the spouse – can take its toll. There may also be times when some decisions you took about your Life have misfired and you are swamped with guilt and self-pity. Or someone you deeply love someone who was you anchor, your everything, is suddenly gone – is felled by Life and is dead. Each of these situations – and many more – can happen to anybody. It can happen to you. It can happen to me. The normal reaction in such times is to feel depressed. You will be deluged with a lot of questions in your mind. Questions for which you will have no immediate answers. What is the meaning of Life? Why am I having to face this problem situation? Why me, now? Is there really a God out there? If there is God, then why do good people like me have go through pain – and suffer? Why should I live any longer? Why is the world full of cynical, scheming, uncaring people? Where can I find love? Where can I find home? Just the vast range of questions, and the lack of answers, can weigh you down even more. And you will end up being more depressed than you already are. But know and remember this: allowing depression to take over is not the way to respond to Life. In fact, when depression strikes and you sense a ‘lack of meaning’ in your Life, get up, even if you don’t feel like it, and push yourself to keep walking, even if you lack the energy or intent to even take the next step. As much as you may think that Life has been cruel to you by placing you in a certain situation – joblessness, a critical health challenge, a divorce, widowhood, death of a child, a business failure or whatever – the truth really is whatever it is now that you have is really your new Life. Being depressed means continuing to mourn the Life you once had. But think about it. What was once is gone. It is not going to come back. No matter how hard you pine for it. Feeling lost and feeling depressed are convenient ways of saying you want to delay, you want to postpone living. Fine. But Life will go on. Just as the characters in Finding Fanny discover, your years will simply pass you by. There’s no point waking up later in Life and wailing that you lost such a lot of time just feeling depressed. Instead, when dealt with Life’s twists and turns, learning to accept what is, the way it is, taking it all in your stride and moving on – you will discover, is intelligent living! You don’t feel lost in Life because Life has been unkind to you. You feel lost because you don’t understand, or often you don’t want to understand, that the Life you have is the onlyLife you have. When you realize that you must live this Life that you have – no matter what circumstances exist – to the fullest, relishing every moment of the experience, you will have found yourself! Author AVIS ViswanathanPosted on September 18, 2014 March 14, 2016 Categories Acceptance, Arjun Kapoor, Art of Living, Bollywood, Depression, Dimple Kapadia, Finding Fanny, Happiness, Homi Adajania, http://schemas.google.com/blogger/2008/kind#post, Inner Peace, Intelligent Living, Naseeruddin Shah, Pankaj KapurLeave a comment on A lesson in finding yourself from ‘Finding Fanny’!